Medford Roofing realizes that new construction projects require extensive planning. For this reason we work directly with industry leaders to help provide strategic plans that consistently deliver the most effective results. 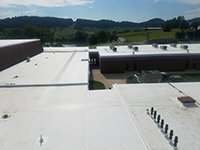 We also understand that each new construction project is uniquely different so our extensive knowledge will ensure that you will receive the most effective roof system and all of your roofing needs will be met. With our quick response times, Medford Roofing is able to get the job done on time and within budget. Because of our past experiences, we are able to service a wide range of industries; which include but are not limited to, healthcare, educational, government, retail, industrial, and more.